Premier Li Keqiang met with more than 300 representatives of business groups attending Summer Davos Forum in Tianjin on June 28. Klaus Schwab, founder and executive chairman of the World Economic Forum, and other business leaders delivered speeches and asked Premier Li questions. Premier Li addressed their concerns regarding China’s economic status, structural reform, manufacturing upgrade, and financial and capital markets. Premier Li said reform is the fundamental driver of China’s economic development. China has forcefully advanced structural reform, especially supply-side reform, said the Premier. Reform efforts to streamline administration, delegate power, strengthen regulation, improve government services and replace business tax with value-added tax and the implementation of an innovation-driven development strategy have given a strong boost to mass entrepreneurship and innovation and further unleashed the creativity of the people and potential of the market, said the Premier. “The development of new economy and new businesses has exceeded our expectations, giving a strong support for employment,” said the Premier, adding that progress has been made in the transformation and upgrading of traditional growth drivers. All this has helped China’s economy maintain a medium-high growth rate and optimize its structure, said the Premier. Premier Li said as the largest developing country in the world, China is still in the process of industrialization and urbanization. 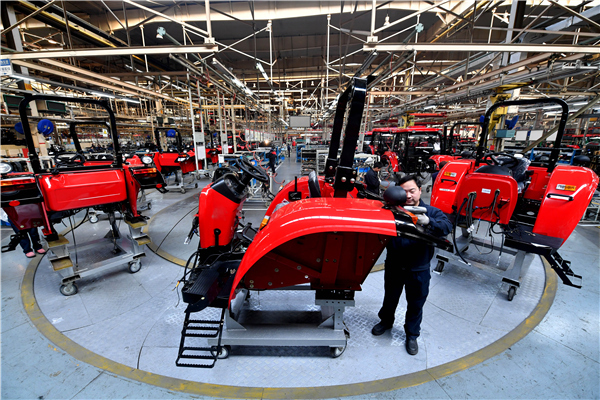 Made-in-China 2025 and Internet Plus strategies aim to promote the smart upgrade of China’s manufacturing industry and better meet the always changing and diversified market needs, said the Premier. He said as a responsible big country, China will stick to market rules and the rule of law, take various measures to cut outdated capacity, re-assign redundant employees and secure their legal rights. The Premier stressed that China will boost the development of the capital market according to market rules and the rule of law, improve financial supervision and prevent systematic and regional financial risks. He said that China is devoted to transforming and upgrading its economy through opening-up and further relaxing market access, creating a fair competition environment and turning China into the world’s biggest investment market and most attractive investment destination. Premier Li said he welcomed enterprises from home and abroad to grab opportunities to expand business in China, jointly contribute to China’s future development and achieve win-win results. China played a decisive role in the world economy, and Premier Li not only mapped out China’s future development vision, but also introduced some reform and opening-up policies at the Davos forum, which consolidated the global community’s confidence in China’s economy, said Schwab. He said the forum and its members will actively pass on China’s messages to the world, and continue to support the country’s development. State Councilor and Secretary General Yang Jing and Minister of Science and Technology Wan Gang also attended the meeting.